It feels as though the past two days have been one long meeting, but we also squeezed in an inspection tour at AAM with Dave Weed, Bauke Houtman of NSF, Ryan of Radar Marine in Bellingham, and of course the whole crew of AAM. Clockwise from left: Richard Furbush, Dave Weed, Mark Gleason, Pat Manley, Bauke Houtman, and Ryan of Radar Marine. 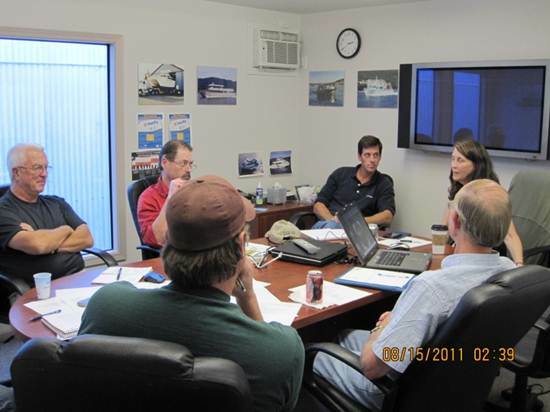 We discussed the wheelhouse design, integrating the multibeam and ADCP into the construction plan, the construction schedule itself, sea trials, the console for the hydraulics systems and winches, technology and wiring for the smart classroom, integrating the navionics systems with the classroom, arranging the arrival of other Middlebury College equipment, running cables from external equipment into the lab, the wire-out systems and alarms for the instrumented sheave, and the list goes on. The MRI grant has been announced on the College website. Tom, Richard, and I are off to Bellingham to meet our NSF Program Officer for a major meeting at AAM. Never a dull moment! We’ve just been notified that our MRI proposal will be funded! This new NSF grant will be used to purchase the multibeam sonar and underway ADCP we requested last January. We worked very carefully with AAM and all of the equipment vendors to ensure that every expense related to purchasing, installing, and verifying this new equipment on the vessel could be provided through the MRI grant. No vessel contingency funds will be needed. We are elated. This vessel will be capable of so much — the possibilities are really thrilling!